WP Brain is a WordPress plugin that allows you to easily create subtle settings for displaying content depending on various factors — from the user’s role to a certain time of day. WP Brain uses shortcodes and filters to implement complex tasks using simple methods. Setting the visibility of content and various site blocks (for example, certain menu items or widgets) is one of the main tasks of the WP Brain plugin. You can customize the visibility of the content or site blocks according to different criteria: the type of the user’s device, geolocation, date and time, the user’s role on the site and much more. Thus, you get the opportunity to create a flexible internet portal, which can be tailored for each visitor individually. Applying the settings of WP Brain is done by inserting shortcodes on the necessary pages of your WordPress site. The process of creating shortcodes will not cause difficulties even for novice WordPress administrators, because it is implemented through a visual editor that does not require knowledge in the field of web development. 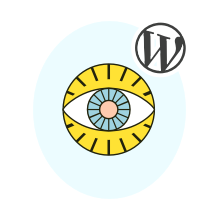 WP Brain is compatible with all necessary services and WordPress plugins. This compatibility ensures that your project will run smoothly and correctly using all the additional visibility settings from WP Brain. For advanced users WP Brain offers a complete set of HTML and PHP files for further development. The creators of the plugin guarantee a readable and understandable code, which is an important factor for web developers. Advanced data sources for custom filters. Include PHP and HTML files in your posts. Clean, secure and optimized source code. Online knowledge base (coming soon). Online filters library (coming soon).